Thank you for making a pledge to Hatian History Channel Fundraiser. We will notify you by email when the fundraiser is launched! Help us educate the world about the forgotten contributions of Haitians and of people of African descent to America and the world. to endorse Alexandra Barbot's fundraiser for Haitian-American Historical Society. The Haitian American Historical Society is going mainstream, with a brand new show being featured in May :The Haitian History Channel. 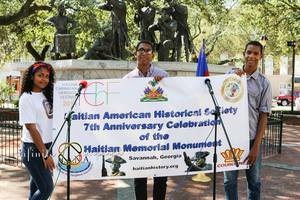 The organization funded in 2001 to educate about the contribution of people of African descent from the island of Haiti, to America and the world after building a Haitian Memorial Monument in Savannah Ga., for Haitians that fought October 9th 1779 .at the battle of the American Revolution, is reaching out through a new television show. Support the organization by donating to this cause. Endorse Alexandra Barbot's fundraiser for Haitian-American Historical Society. Log In or Create An Account to endorse Alexandra Barbot's fundraiser for Haitian-American Historical Society. The truthful knowledge of historical facts always highlights the basis for the better understanding among people and/or communities who have lived the same experience or have shared separately similar account of past glory/suffering. "It is our hope that the Haitian American Historical Society will promote understanding and positive cooperation between others of African descent towards a better appreciation of their common heritage." The Haitian American Historical Society is dedicated to investigating fully any past circumstances where Haitian's contributions have been identified, and hereby pledges to cooperate and collaborate with other organizations and/or entities committed to achieving the same. The organization seeks truth and accuracy in historical events where the conviction of the participants serves as foundation for mutual respect and cross-ethnic collaboration. The organization seeks to highlight the contributions of Haitians and Blacks through various means of documentation: identify, research and compile data of Haitian and Blacks who have performed deeds of great historical significance. The organization seeks to show the accomplishment of the historical stature of Haitians and Blacks through various means of dissemination of knowledge: educate the American public and the world through HAHS representatives' networking with other organizations, participation and sponsorship of forums for public audiences, and participation and sponsorship of school-based programs and projects. The organization seeks to promote diversity of cultural history through programs and projects that bring together persons of different ethnic backgrounds for interchange. Pledge to "Hatian History Channel Fundraiser"
Donate to "Hatian History Channel Fundraiser"